From Betty's RV Park, Abbeville, Louisiana Pam was suffering with a head cold when we reached Abbeville so she and and Ernie didn't go with Joyce, Charlie, Wayne and me on that first full day in south Louisiana. 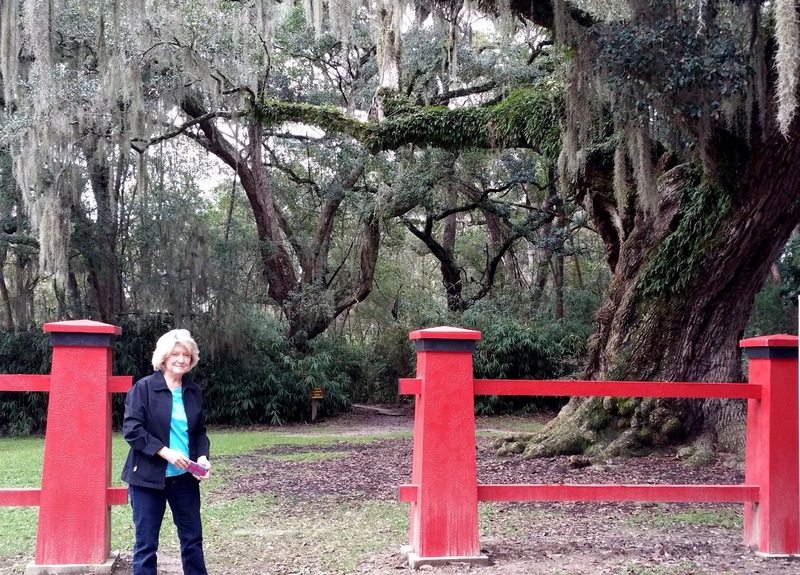 The four of us drove south to New Iberia and Avery Island with a plan to see whatever we could squeeze into the day. First stop... Conrad Rice Mill. 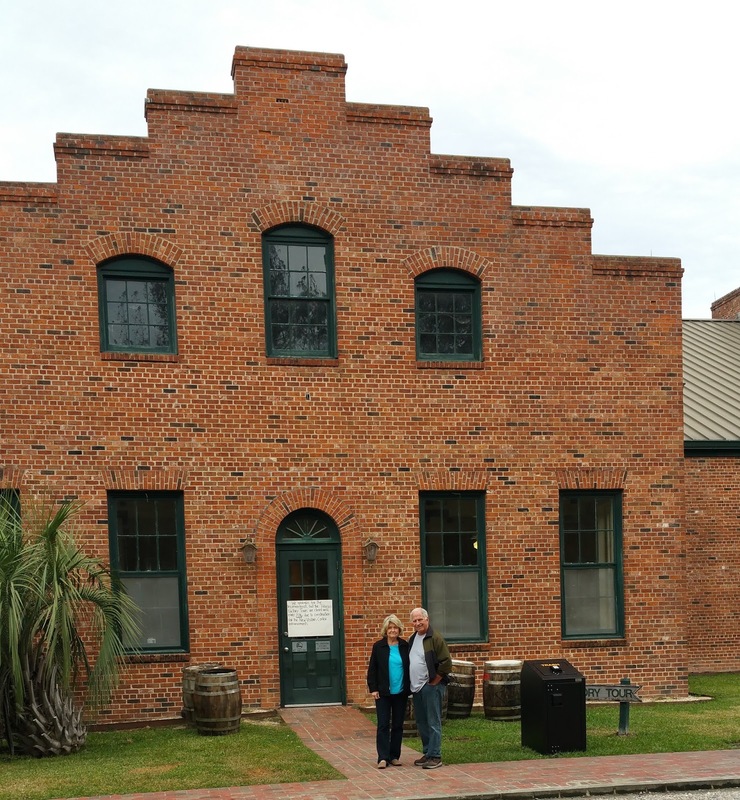 It's the oldest rice mill in America. 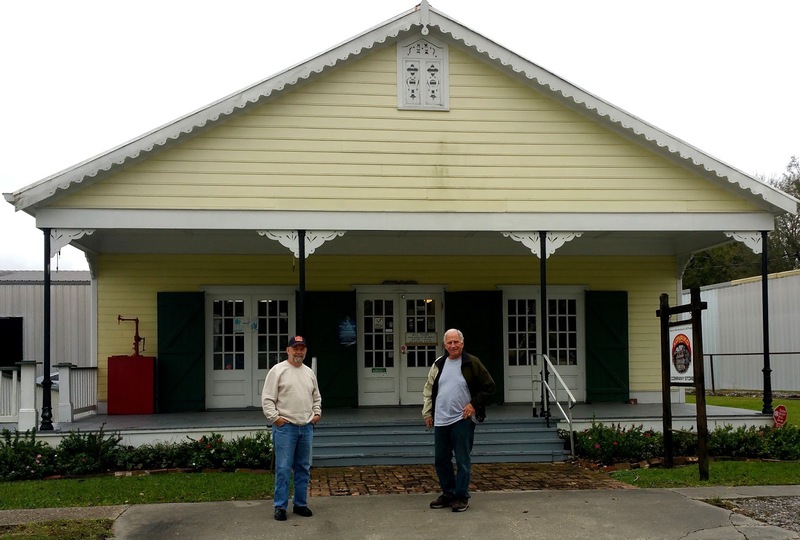 It is also one of the leading tourist attractions in the Bayou Teche area. Mr. P.A. 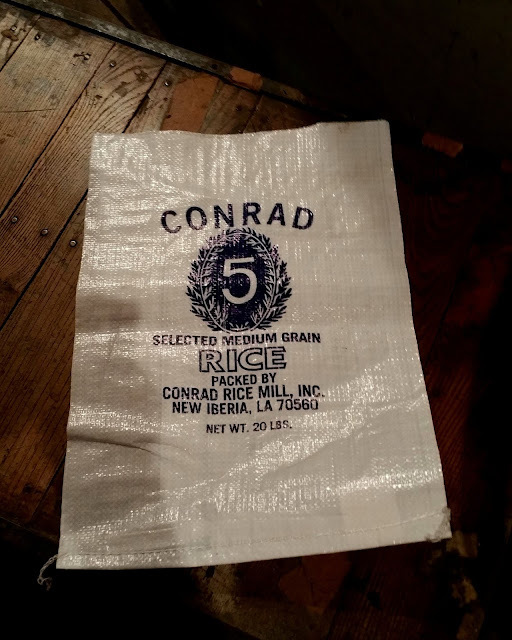 Conrad founded the Conrad Rice Mill and Planting Company in 1912. He cut rice by hand and let it sun-dry on the Louisiana levees. Joyce, Charlie and Wayne in the Konrico Rice Company store. 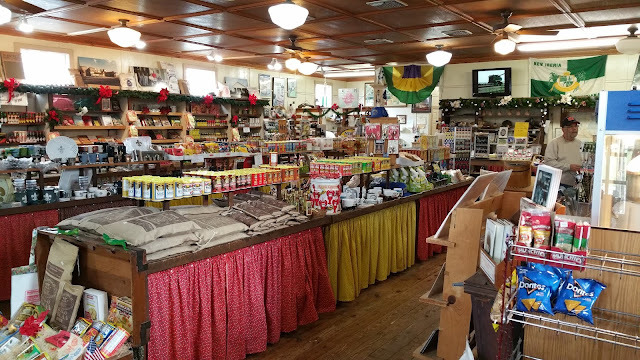 The company store was an enjoyable experience in itself. 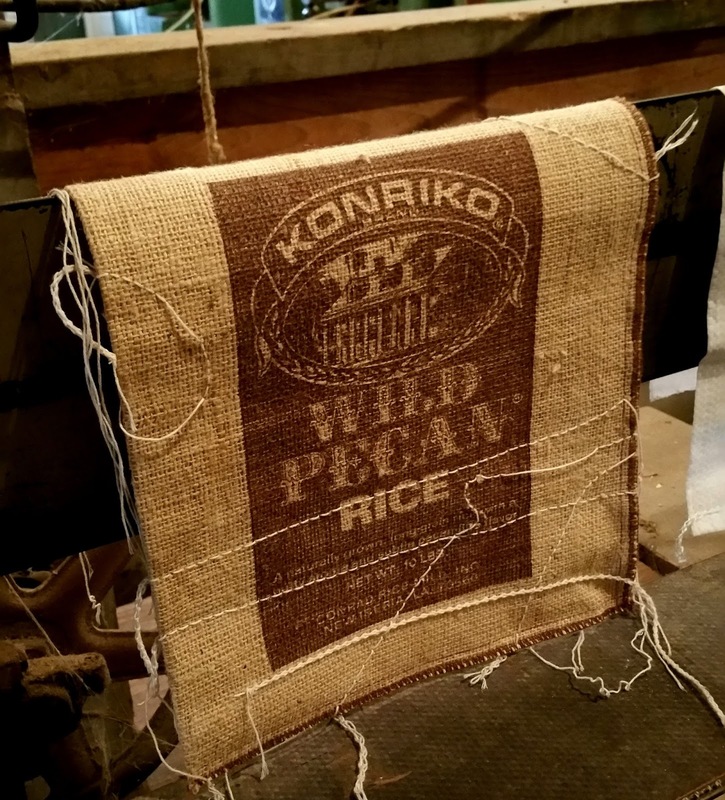 Every morning a fresh batch of Konrico rice is made for visitors to sample along with a variety of rice flavorings. Joyce and I bought souvenirs and taste tested everything. 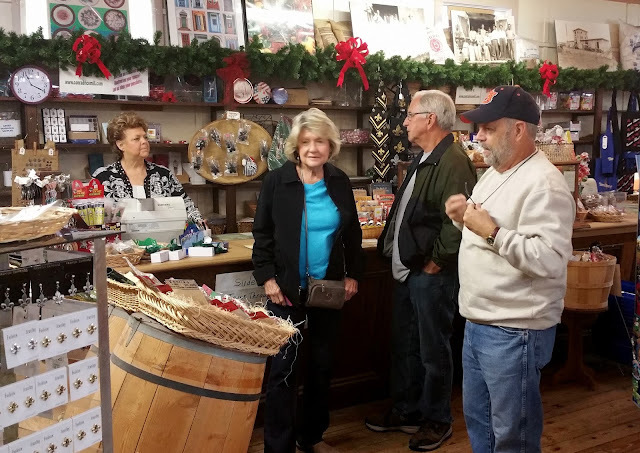 Upon our arrival, the lady behind the counter, Myrna, (in the picture above) showed us to a stock room in the back of the store where we watched film that began with the Acadians deportation from Canada, their migration and finally their settlement in this area. 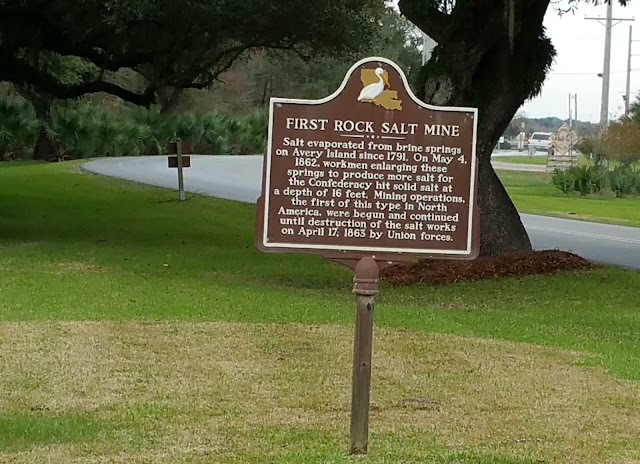 The film described the love story of Evangeline and Gabriel and told about the culture of this area and the importance of rice in the diet of Louisianians. 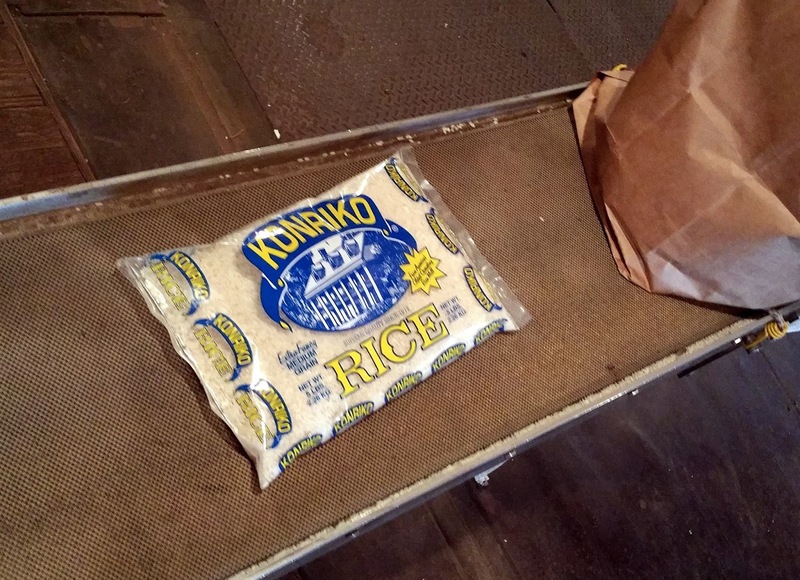 After the film, we were escorted into the mill for a first hand look at how Konrico rice is processed to this day. The original part of the mill was built in 1914 and received additions in 1917 and 1930. It is a rare surviving factory with a belt-drive power transmission, whatever that is. If I heard, I forgot. 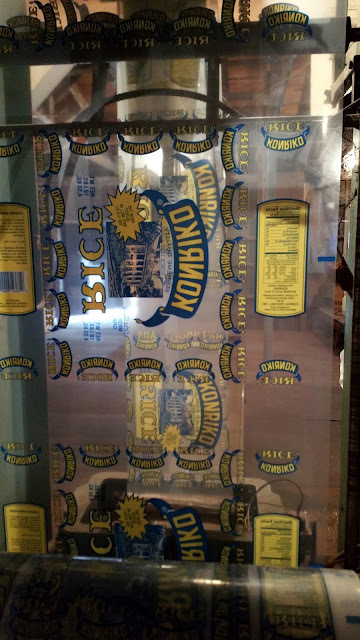 In the 1950's, "KONRIKO" was trademarked as an acronym for "Conrad Rice Company." 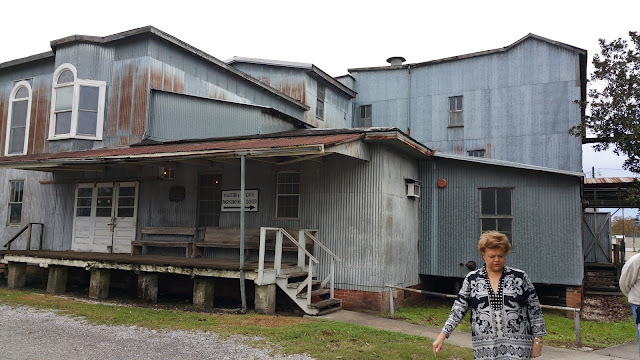 Myrna took us from the store into the mill. She's a one-woman operation. 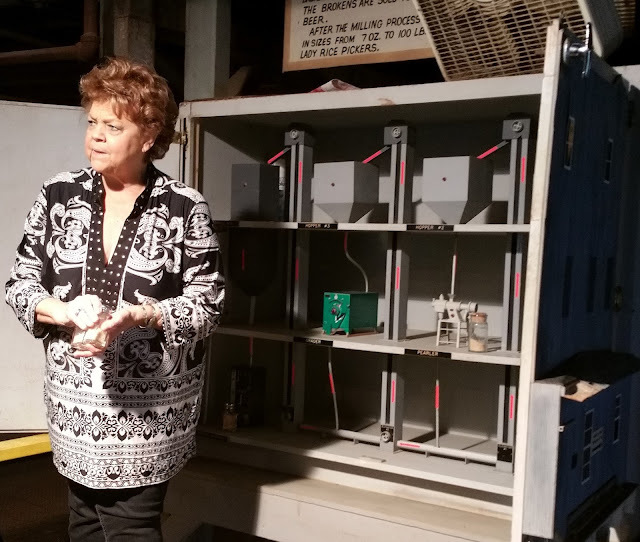 Myrna explained how rice is processed here in the mill from delivery to the mill until it's packaged for stores. 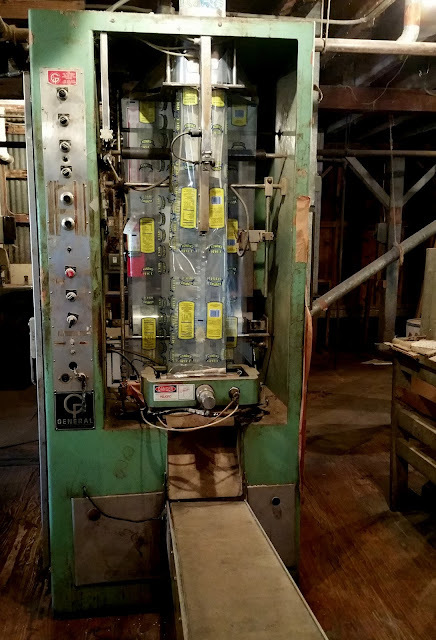 I was astonished to see the these old machines still used to package the rice we see in grocery stores today. Ready to be shipped to your local grocer shelf. The packaging is a long continuous roll of cellophane that is folded, sealed, filled and closed. Another variety of rice will go into this bag. An old sewing machine stitches the bags once they are filled. 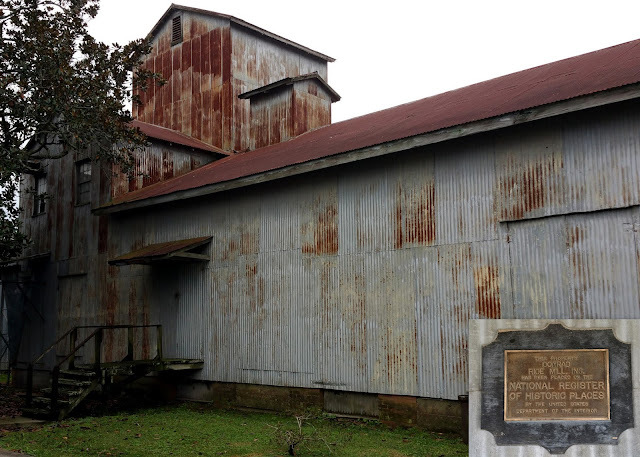 In 1981, the Mill was placed on the National Register of Historic Places. Next stop: Bon Creole Lunch Counter. 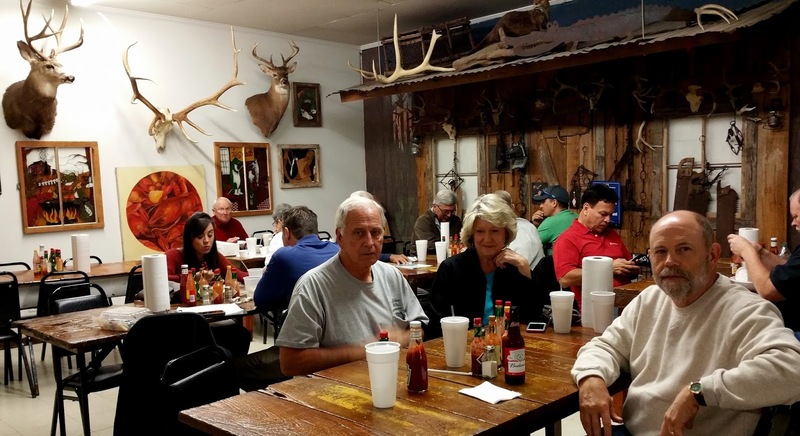 This lunch counter was recommended by several as a place to enjoy authentic Louisiana Cajun cuisine. Having lived in Louisiana, Wayne and I know with certainty, that good restaurants are not always what they seem from the outside. The four of us rolled out of the truck and into Bon Creole. Joyce and I ordered the daily special: Shrimp Stew. Wayne and Charlie ordered po-boys. 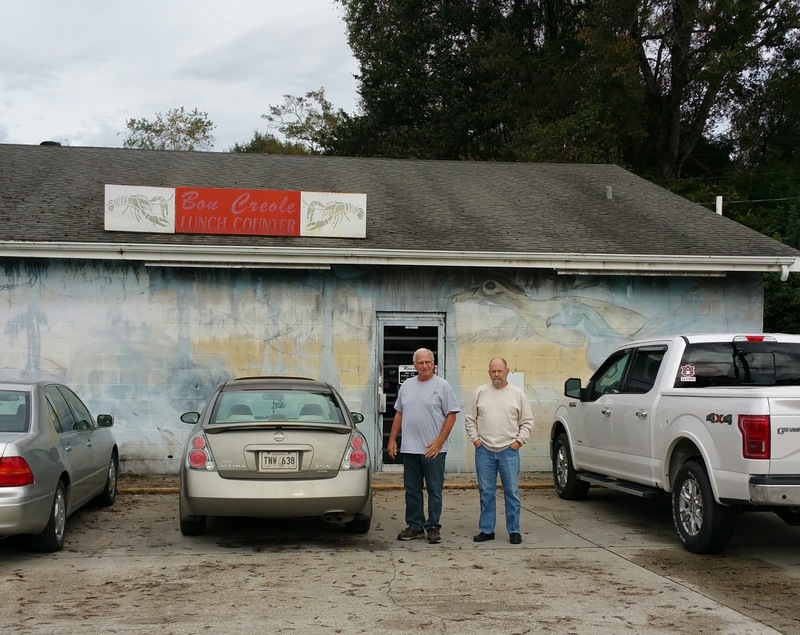 Sadly, our experience at Bon Creole did not live up to our expectations or the good reviews. Nevertheless, we had a good time and the food wasn't awful -- it just wasn't spectacular. Bummer. Lots of good Louisiana Cajun atmosphere inside Bon Creole. 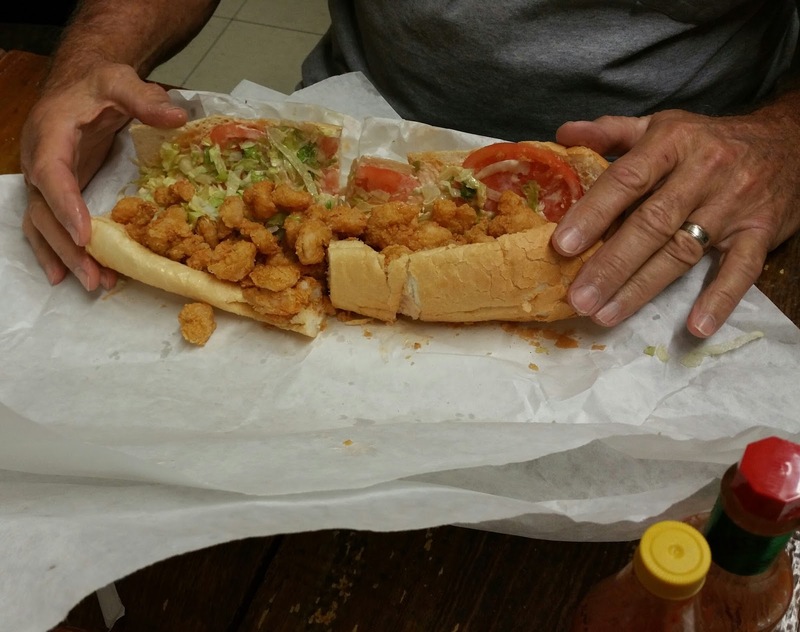 Just call us "Hot Stuff"
Charlie prepares to eat his shrimp po-boy. 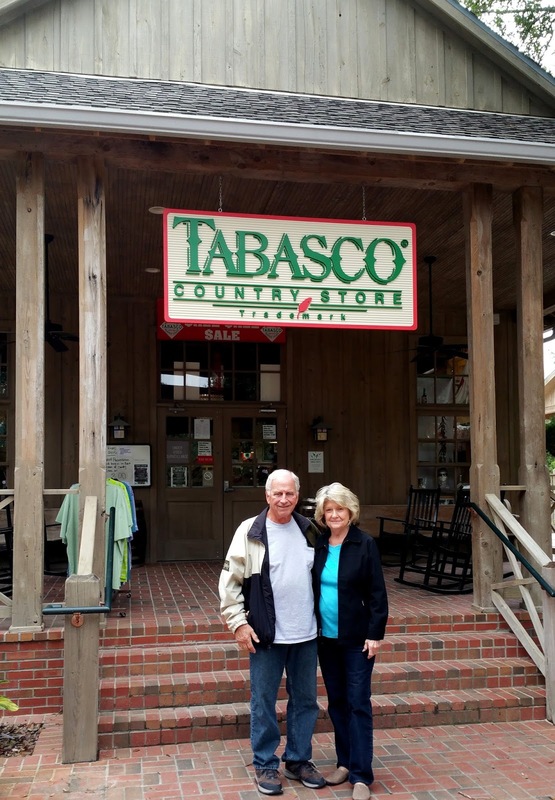 From New Iberia, we took the short ride south to Avery Island where Mr. McIllhenny and his Tabasco plant are located. 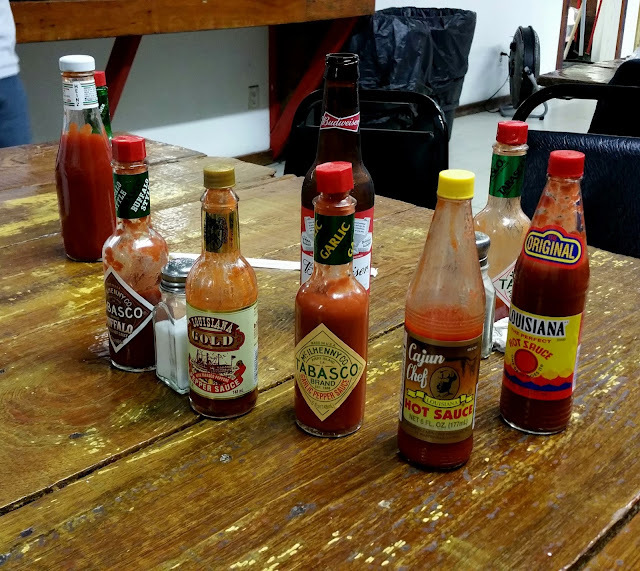 A tour of the Tabasco packaging facility has been on my bucket list for awhile, though I don't use Tabasco sauce, personally. 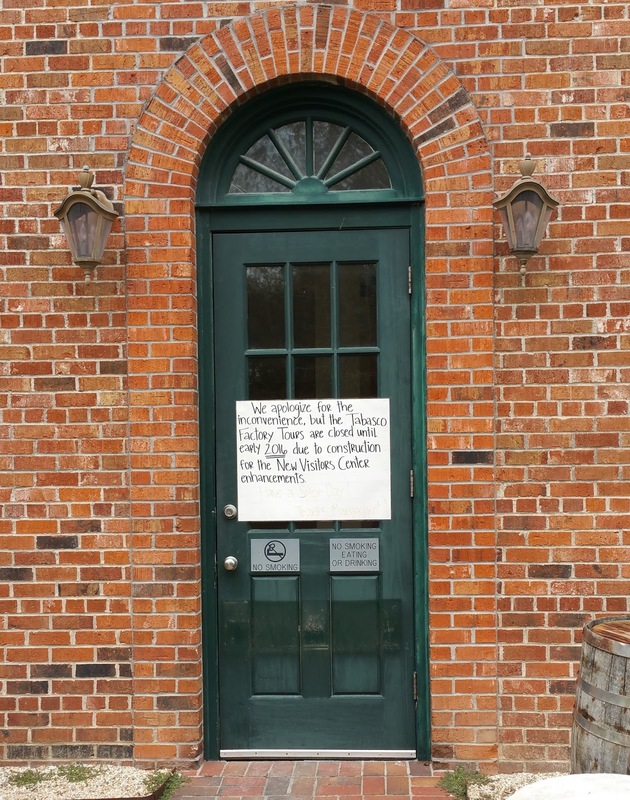 We found this sign on the plant door. "We apologize for the inconvenience, but the Tabasco Factory Tours are closed until early 2016 due to construction for the New Visitors Center enhancements". 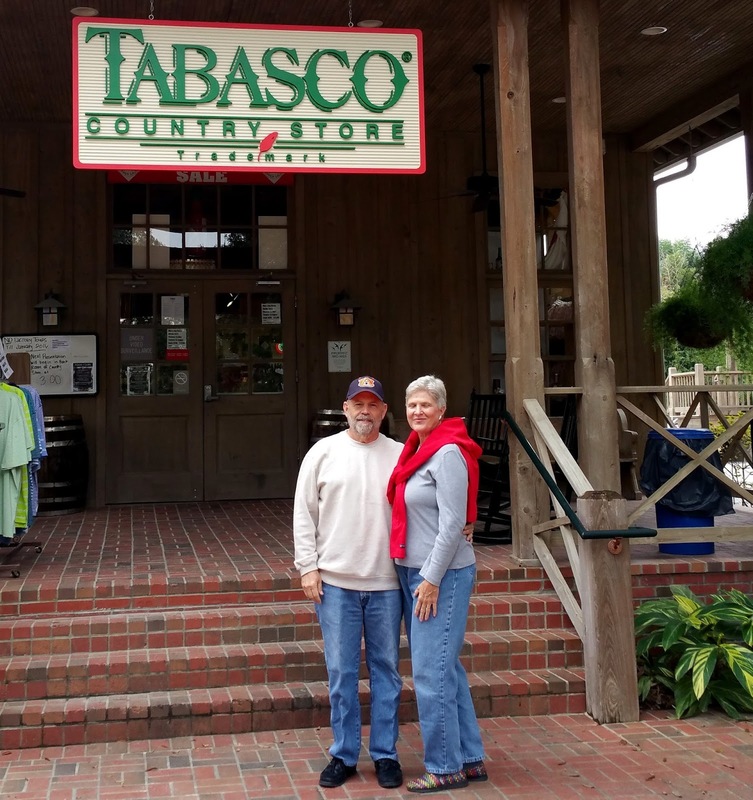 Not to be discouraged, we went on into the Tabasco Country Store and watched an informative film about the history of Mr. McIllhenny, his family, the Tabasco recipe and the process. We tested a bunch of Tabasco products including ice cream, which curiously, was good and tasted a bit like butter pecan. 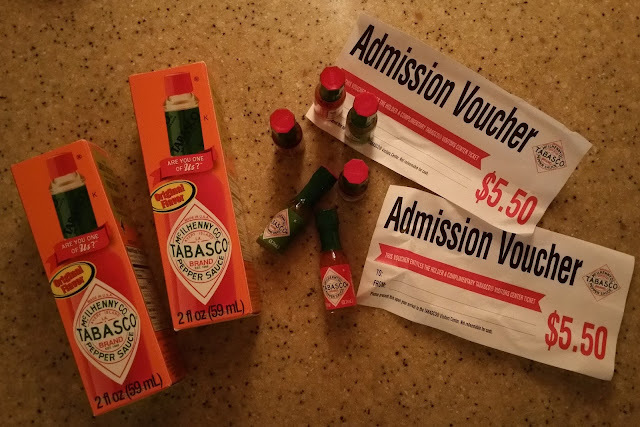 Those who came to Avery Island to tour the Tabasco plant during renovations are given a nice consolation package which includes two large bottles of Tabasco sauce, a fist-full of the tiny sample bottles and two admission vouchers which will NEVER expire. That's about when we'll get back to Avery Island, I expect. Gave our Tabasco to Joyce. She eats it. We don't. Joyce and Charlie had their picture taken here a long time ago. The air around the Tabasco plant carries the smell of hot pepper sauce. Avery Island actually sits atop one of five salt domes in this part of Louisiana. 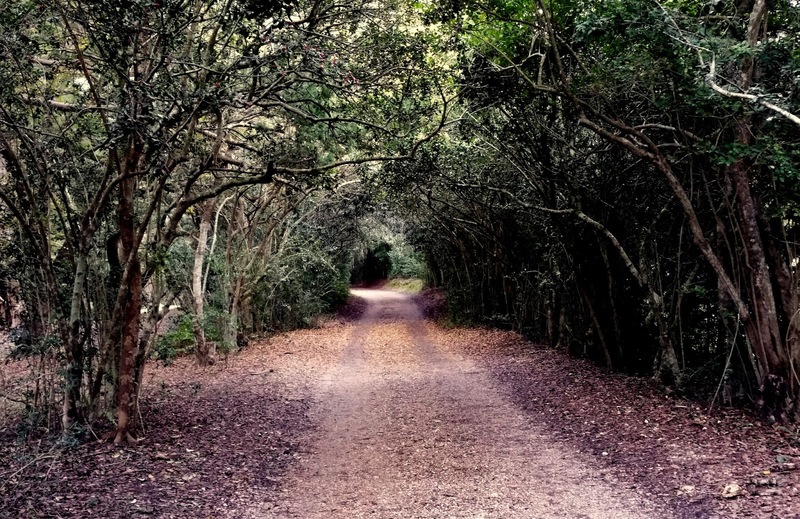 It is also home to Jungle Gardens, a property of the McIllhenny family of businesses. 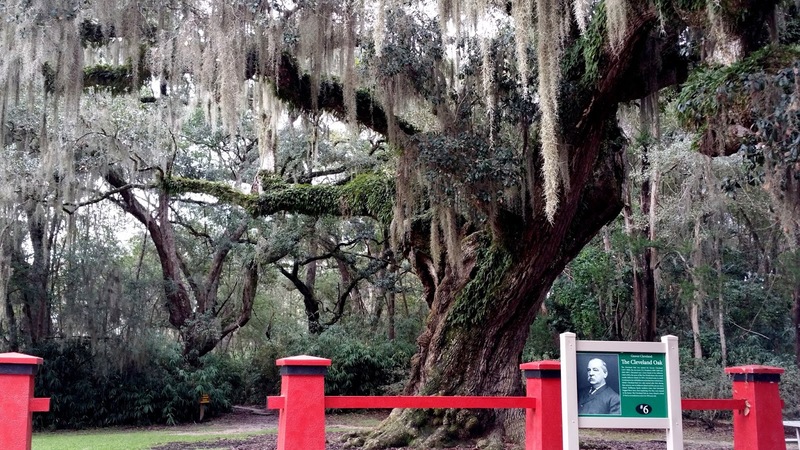 A conservationist, Edward "Ned" McIllhenny was born on Avery Island in 1872 and founded Bird City in 1895 as a private bird sanctuary for the once-endangered snowy egret. The birds were hunted into near extinction for their feathers which were used as accessories on women's hats. President Grover Cleveland frequented this area as a friend of actor, Joseph Jefferson, owner of nearby Rip Van Winkle Gardens. Cleveland loved to take naps under the live oaks so one on each property is named for him. This one is more than 25 feet in circumference and over 300 years old. An inviting tunnel through the juniper branches. 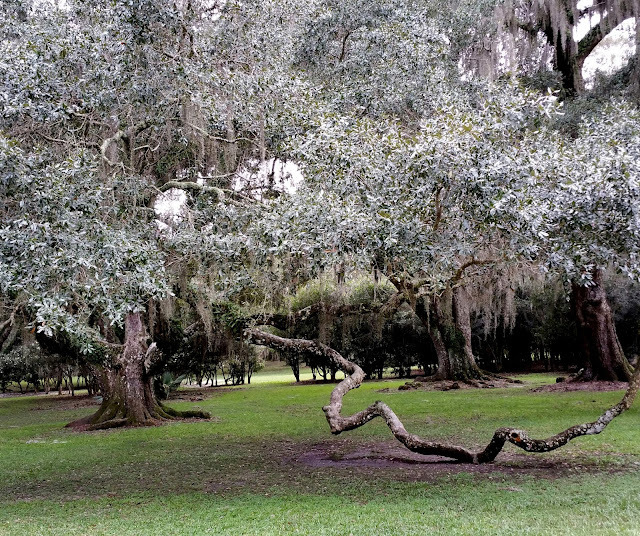 One of the most dramatic live oak trees in Jungle Gardens is this one near the entrance.